Activating this option will allow Next ADI to import & update users from the Active Directory into your WordPress database. The synchronization from Active Directory to WordPress must be either triggered manually by clicking on the Sync to WordPress link in the left navigation menu or by periodically executing a Cron job. Only members of the security groups entered here will be imported. ADI does not support the synchronization of the whole domain because of obvious performance reasons. The prefix id: is used to determine primary groups like Domain Users or Domain Administrators. Primary groups are only used for POSIX compatibility. Instead of using the memberOf attribute/backlink of the user respective the member attribute of the security group, the primary group is persisted inside the primaryGroupID attribute of the user. Importing multiple users at once requires you to have an Active Directory service account with read permission in the AD. Please enter the full user information including the domain suffix. The option User > Account suffix or any other configuration will not be applied for the service account. The Service account username and Service account password are the credentials for your Sync to WordPress service account and will be stored inside WordPress' database. 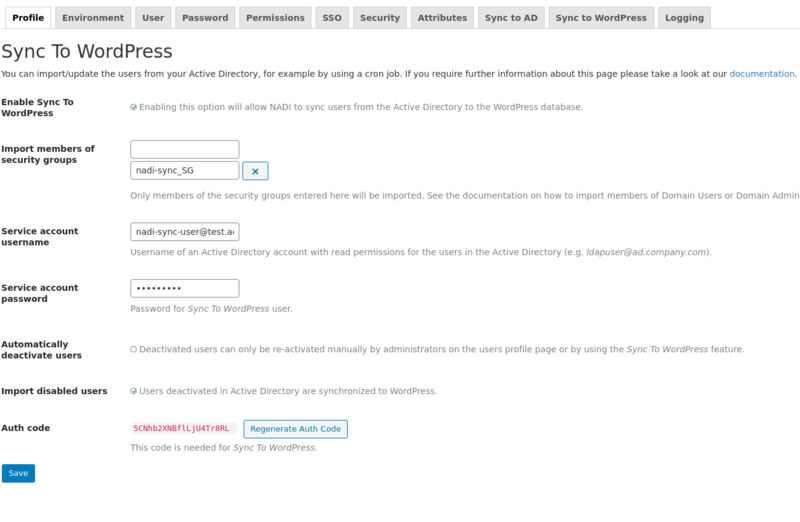 Set the password for the Sync to WordPress service account. Deactivated users can only be re-activated manually by WordPress administrators on their users profile page or by using the Sync to WordPress feature. Example: During the first synchronization from AD to WordPress, the Active Directory users employeeA, employeeB and employeeC are imported. Two weeks later you run the import again, but this time employeeA is deactivated in Active Directory for some reason. employeeA will now be automatically deactivated in WordPress by ADI. With this option you can prevent disabled users from beeing synchronized to WordPress by NADI. The authentication code must be used if you want to trigger the synchronization with help of a Cron job. The menu option Sync to WordPress shows you the code snippets for wget and curl.